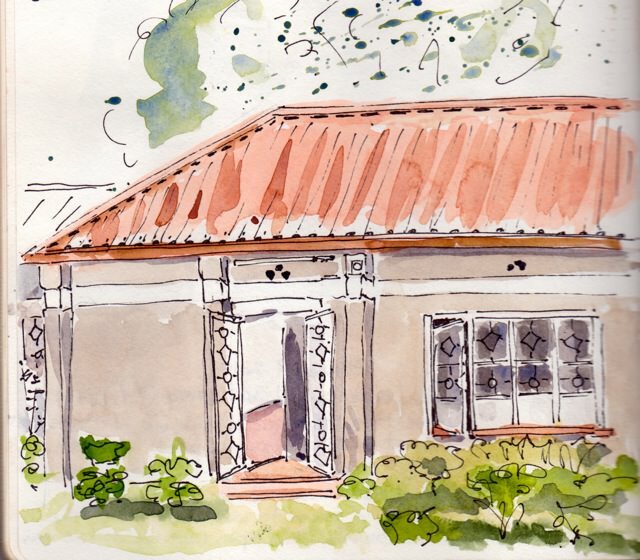 My long-time friend A was here this week for four days of sketching . After visiting the best recycled clothing store on day one, we headed for Kingston via the ferry and lake shore. It’s still very cold in Ontario and the ferry makes its way through the ice. 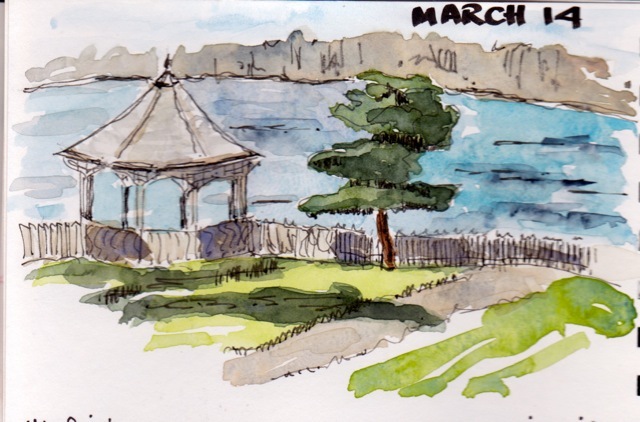 The shore is lined with great old limestone buildings–and I really want to come back in warmer weather to sketch. 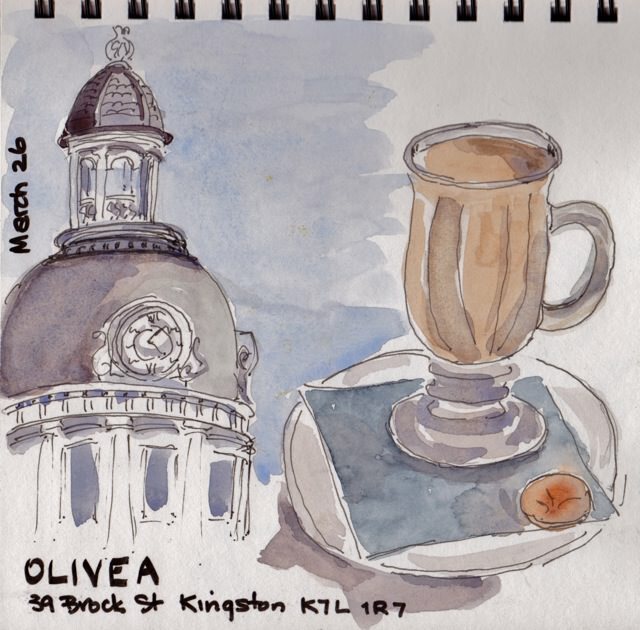 Speaking of old limestone–Kingston is full of it–and we spent a lovely hour in Olivea on the market square sketching the city hall. 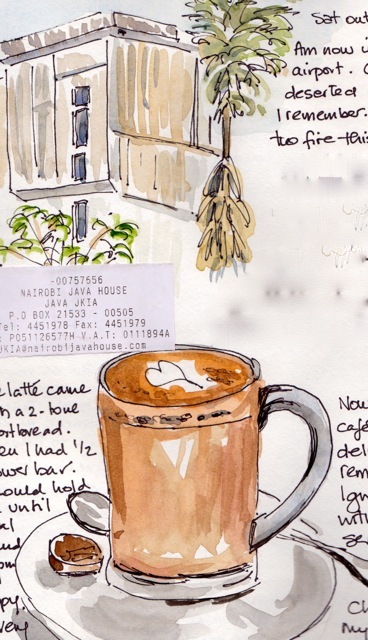 I got some new watercolour pencils this week and used them in this sketch of my favourite place in Bv to have a latte…or a croissant…or absolutely anything they serve. Like so many small Ontario cities, our downtown is in decline and we are soooo lucky to have this gem there. 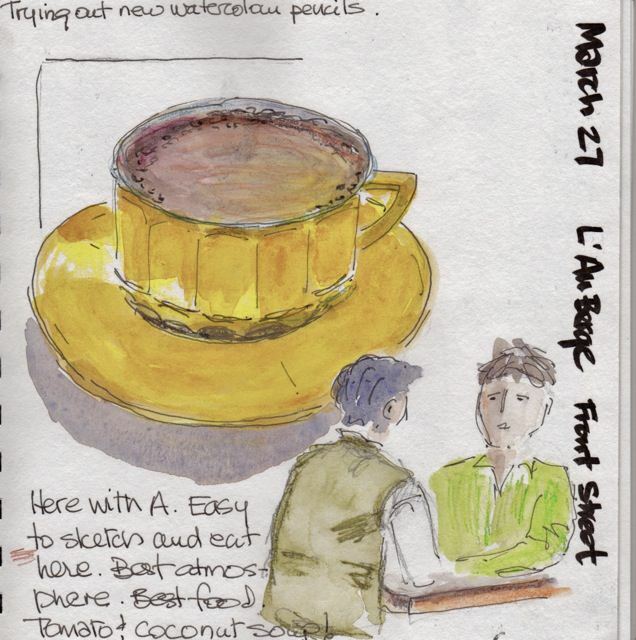 I had just begun to sketch these two men when they finished their meal and left–so a very sketchy sketch of them. 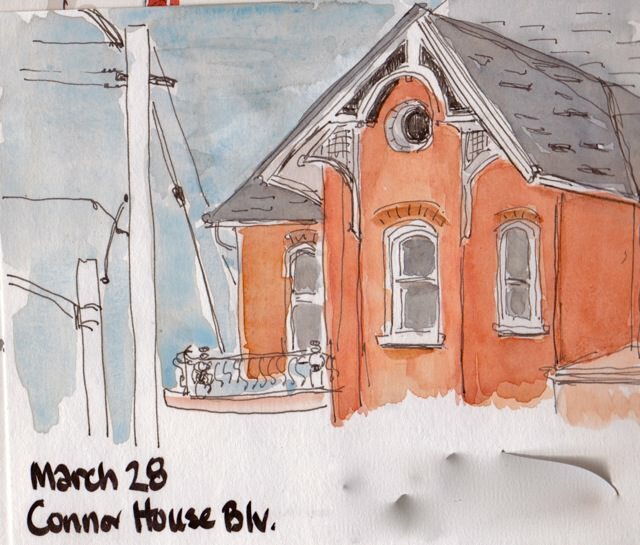 It’s still too cold to sketch outside here, so this was done looking out the library window 30 minutes before a meeting. It’s a great old Victorian with lots of angles and details. I’m trying to do straight on-ink and accept the mistakes, the errant lines, as part of the process. Still trying to loosen up. I begin an on-line course soon and hope it gives me a big push in this direction! I spent two sunny days in Seattle with daffodils and cherry trees before flying back to the snow and below zero temperatures of Ontario. 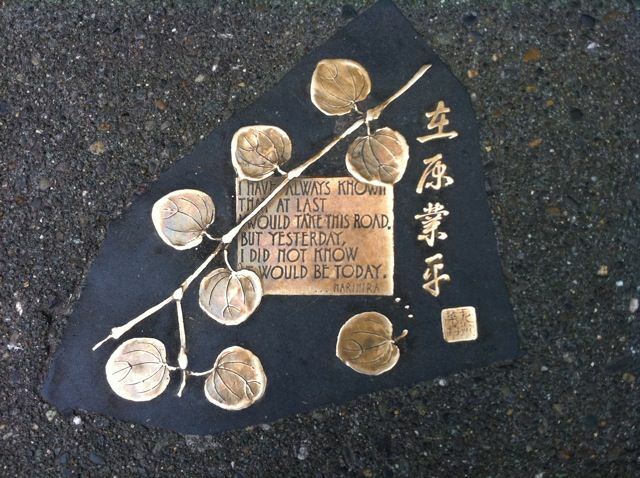 Seattle is a great city, one I have been wanting to visit for a long time and one I will return to. 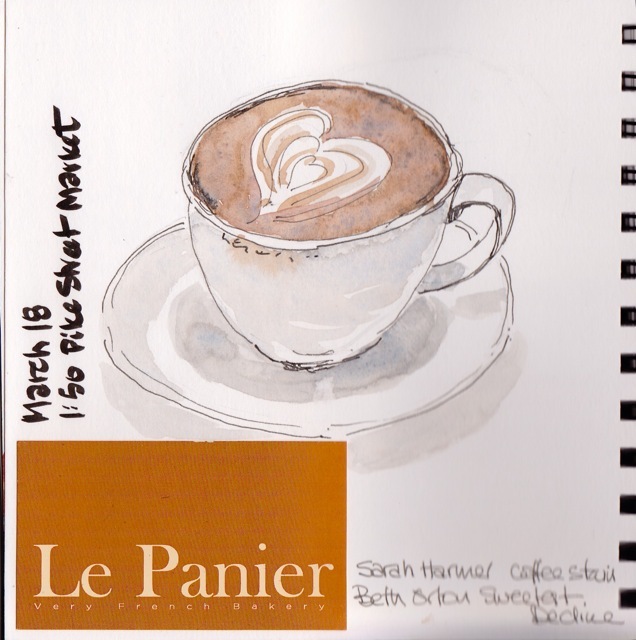 Of course I had to make the requisite coffee visits and do some sketching. In Le Panier I sat with a great Montreal couple who were very interested in my Lamy Joy pen, so I passed on the Goulet connection, simple the best place to buy fountain pens. 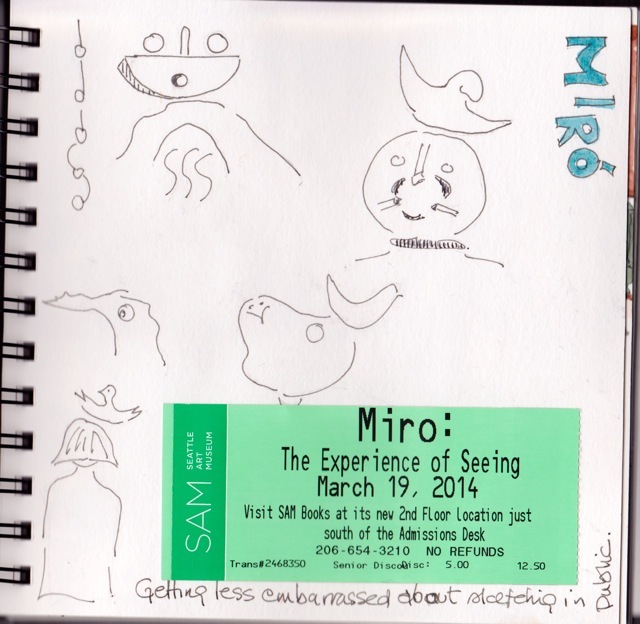 I spent Tuesday at the Seattle Museum of Art and the Miro exhibit (see sketches and review here from Gabriel Campanario) and then a trip on the monorail and lunch at the Chihuly gardens. It was too cool to sit outside to sketch the wild glass sculptures, but I did get a quick sketch of the restaurant window before the delicious crab cakes arrived. 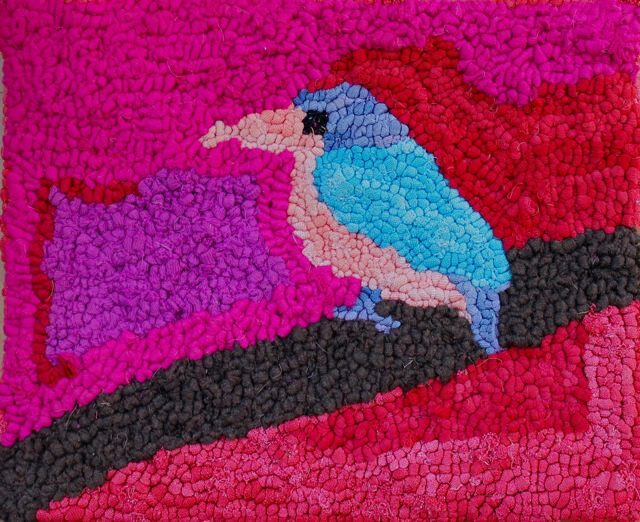 These are some of Donna Hrkman’s fabulous rugs. Of course nothing beats seeing them in person–and these photos were not taken under the best conditions. But their power and intensity (and her talent) are still so evident. There was lots of learning in the four days and there were many wonderful hooked faces, both human and animal, well on their way by the end of the class. Donna teaches regularly and I would highly recommend a class with her. 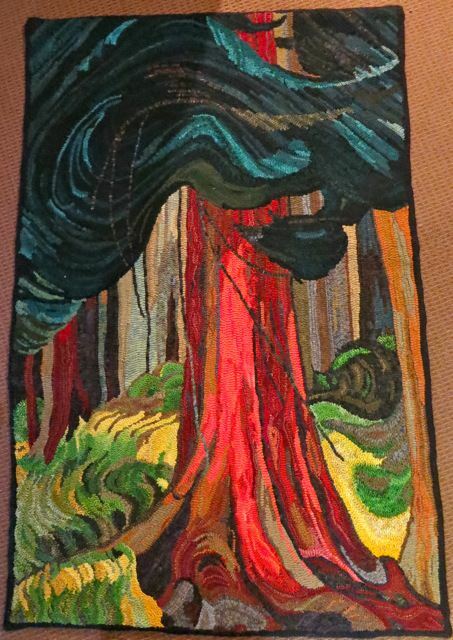 There were three classes at the school (Nola Heidbreder and Liz Alpert Fay also) and each night the students from one of the classes talked about rugs they had brought to share. 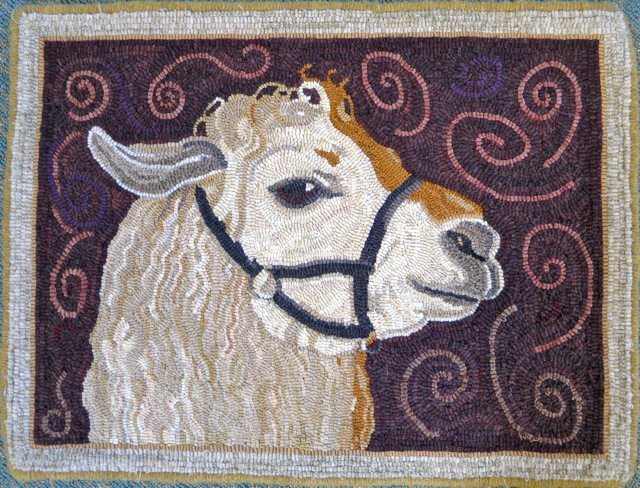 This was a great feature of the school not only because we could see great rugs, but it is such fun to hear the stories behind the pieces. 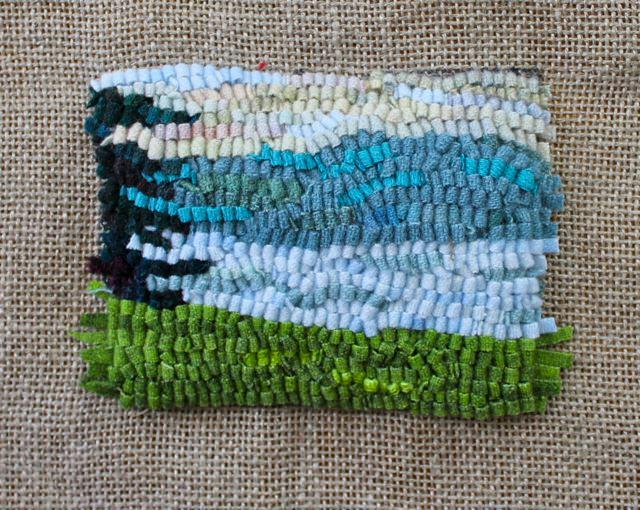 Below are just a few: Sunny Runnells’ Emily Carr, Sarah Judith’s mountain scene and Tanya Graham’s forest. 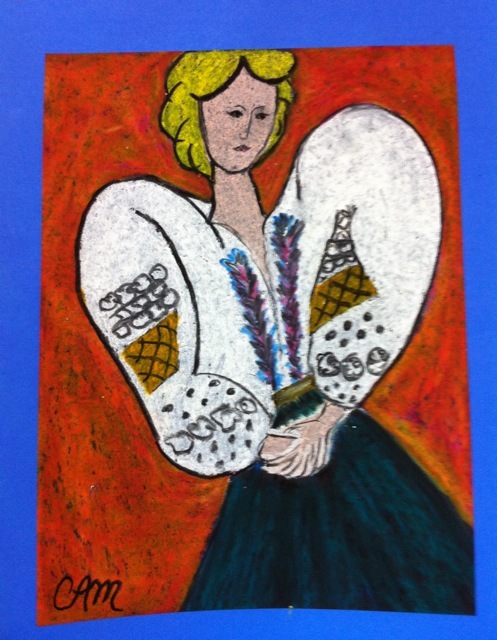 In addition the school offered optional art classes given by Mary Watson. 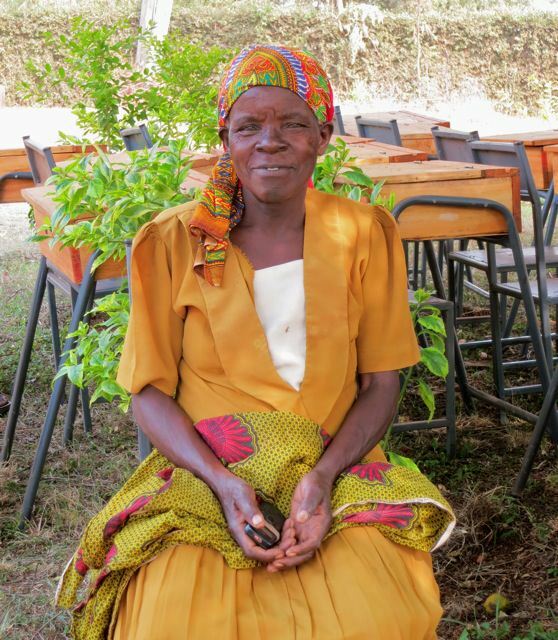 Mary teaches children and took us back to our 9 year old selves, a great freeing approach. 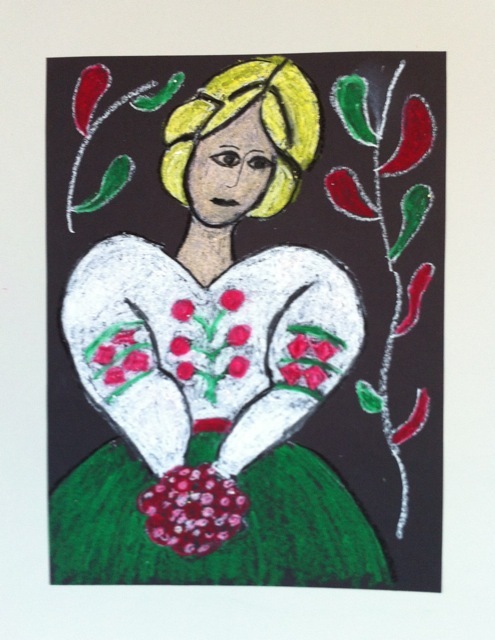 This was my first time ever with pastels and I loved it. 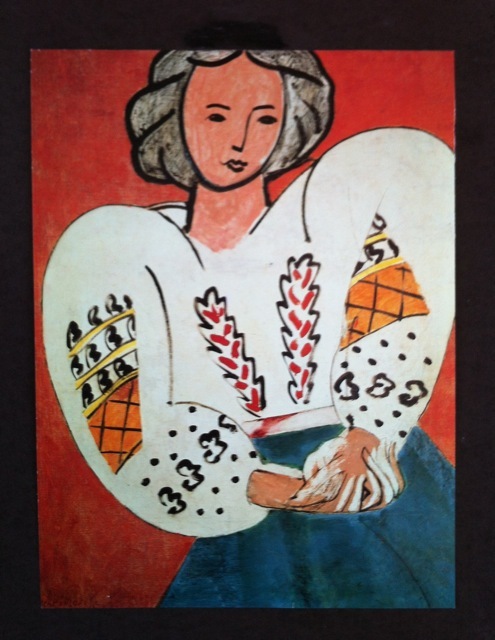 Below is le vrai Matisse, my table-mate Carol’s version and then my demure version. A great school: wonderful people in a perfect place. Thank you Sarah and Michele. I am home from a week on the west coast. 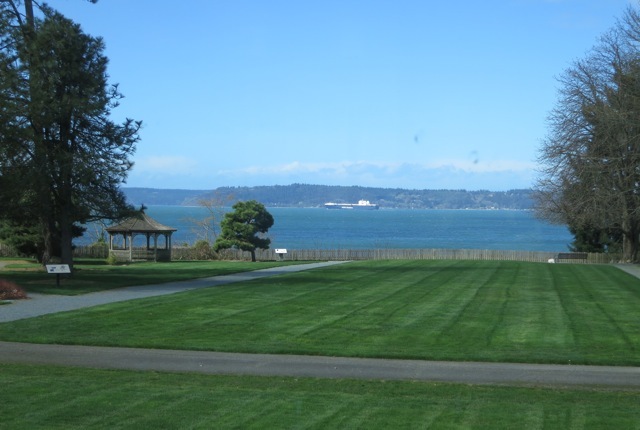 The four days at Puget Sound rug school were outstanding–people, rugs, venue, learning. I highly recommend it! 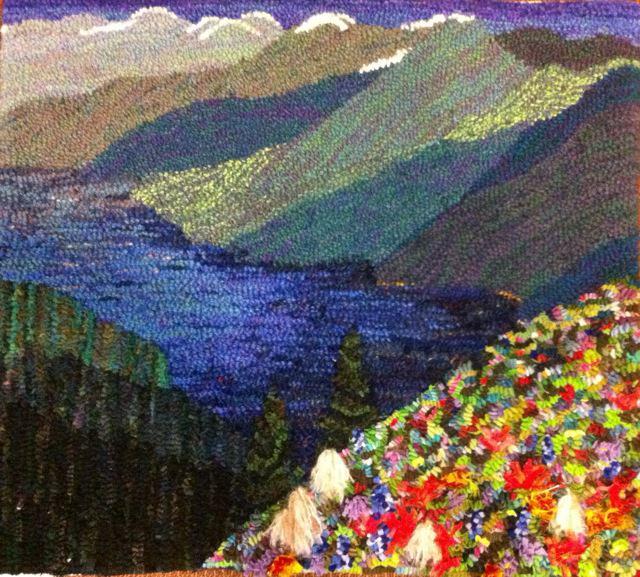 Tomorrow I will post some of the amazing pieces of rug hooking which were there. But for today some views of the location. I had planned to hook some words as I explained in a previous post, but the wonderfully healing landscape drew me away from all thought. 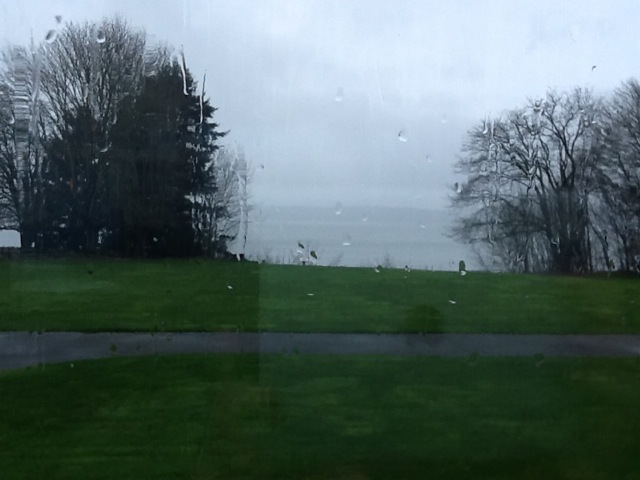 So instead of words, I hooked and sketched rough thumbnails of the view out the window. 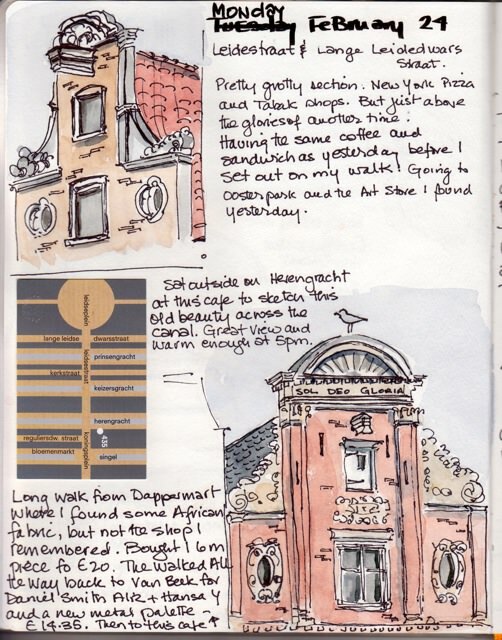 I sketched much of the time I was in Amsterdam. 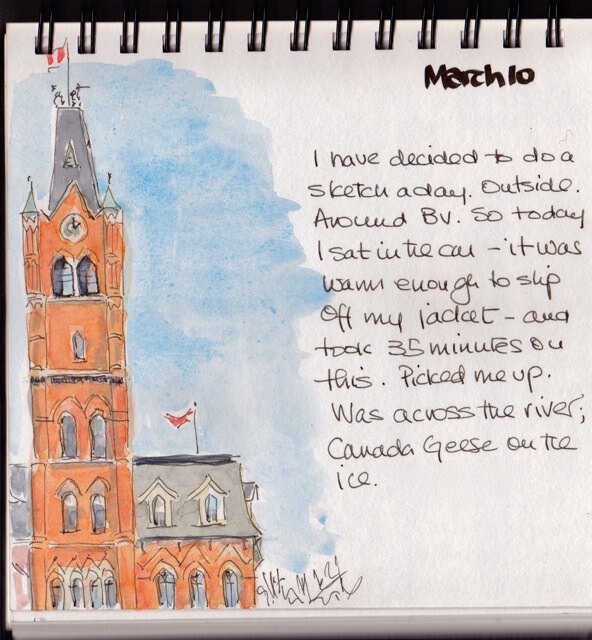 Sketching is the perfect travel companion. It allows you to sit alone in cafés or on benches and not appear lonely or lost. It is a great conversation opener so you end up talking to all kinds of people, mostly real inhabitants of the city, not tourists, and this always provides insights. 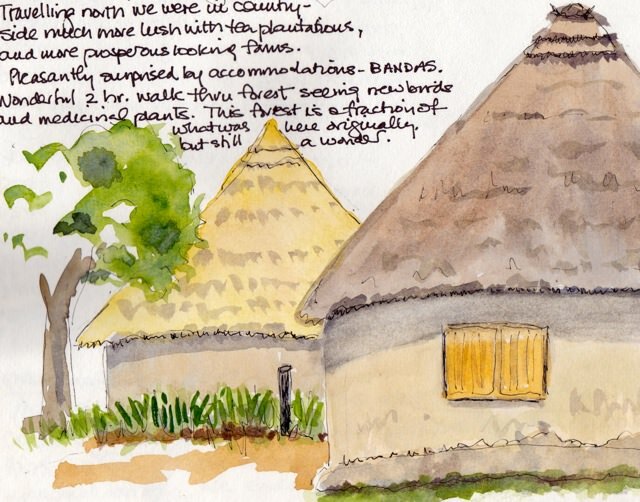 But most importantly, sketching is a way of enhanced seeing, a way of really ‘taking it in’. As I’ve said before, for me it isn’t the quality of the sketches, although I’m always working to improve, but the process of being there and absorbing through my eyes and my pen and paints. 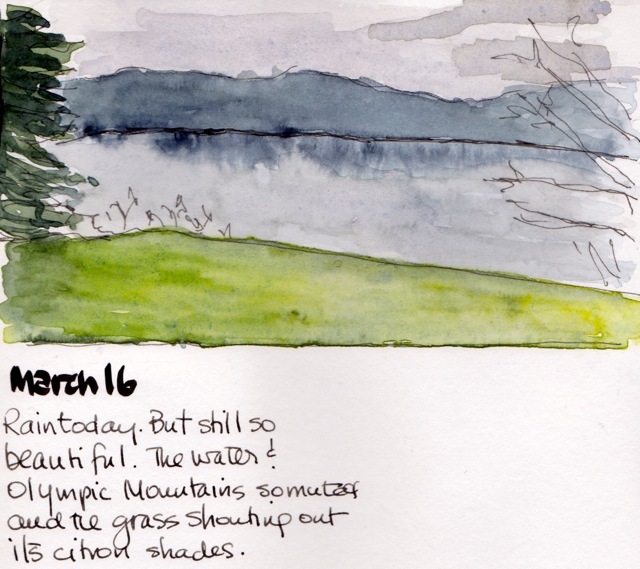 The weather was good while I was there, and by the last of the four days, I was able to sit outside to sketch. 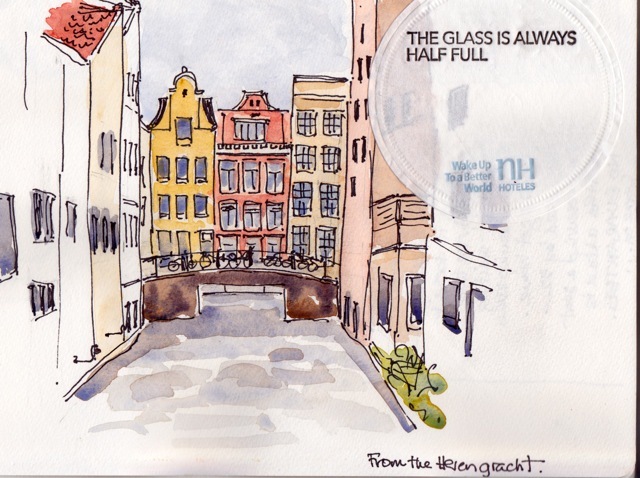 But the cafés and tea shops are perched right on the canals, so there is always a good view from a window seat. Here are a few of the sketches. 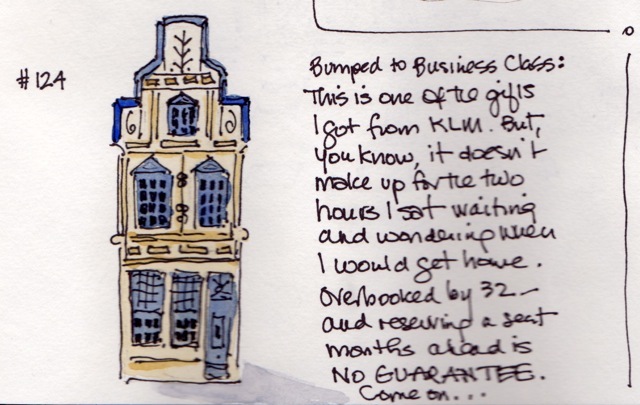 The final one is of a small delft house, a gift from KLM. You can read the text about this–an unceremonious dumping followed by a bumping, 2 hours later, to business class. BTW I was reading The Goldfinch the whole time I was there. This novel which has just been nominated for the Bailey Women’s Prize, (formerly the Orange Prize) begins and ends in Amsterdam in a hotel on the Herengracht. It is a story of deep and unforgettable love and loss–and the essential place of art in our world. The painting of the title is by a 17thC Dutch artist. The book was a bit over the top in repetitive detail, especially about endless drug-consumption and the Russian underworld, but still was a perfect read for my favourite city. It seems to be taking me a long time to return after my stay in Kenya. My friend and fellow traveller, Ruth, tells me that it takes one day for every hour you lose on the flights. Even counting the 8 hours from Kenya, and I did have a four day stay in Amsterdam where I should have made up two of those hours, I should be back in good order. But this time it is a slow return as I process all I saw and learned. I haven’t been anywhere near the studio, so the shop is not open yet. I feel far away from making things. Instead, I’ve been doing things like cleaning cupboards (! 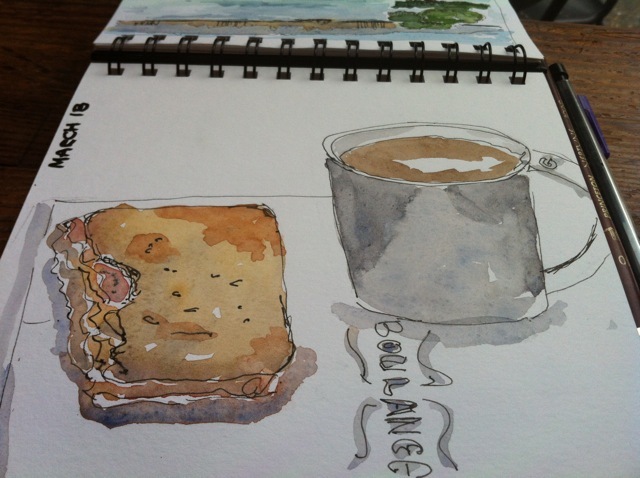 ), sending bags of extraneous things to the Salvation Army and sketching. Sketching every day, everywhere. I got a new small metal palette in Amsterdam at Van Beek’s (more on that in another post) and I tote it everywhere. 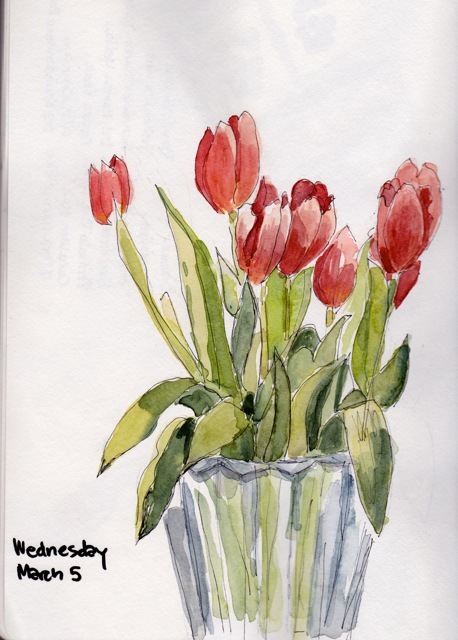 And…I have been sketching these tulips every day. And drawing my way out of the molasses. 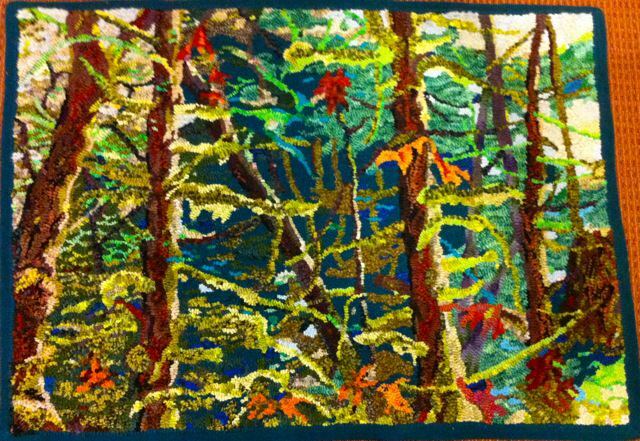 And yes, I am taking off again next week for a four day rug hooking course in Puget Sound with Donna Hrkman and a couple of extra days in Seattle. I have been wondering what to hook in the class because I can’t take my normal equipment or supplies on the plane. 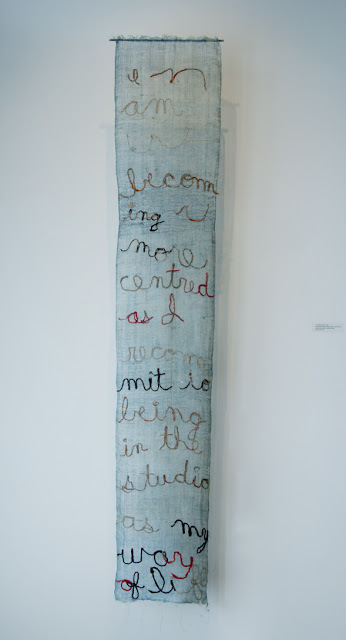 And then this week I discovered Sandra Brownlee who has just been awarded a Governor General’s award in visual arts. 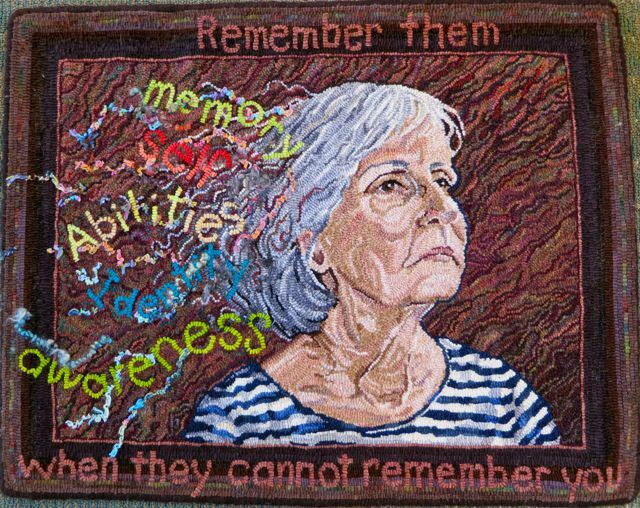 She is a weaver, but uses stitching in much the same way as I use sketching–to work towards understanding what it is she is thinking. 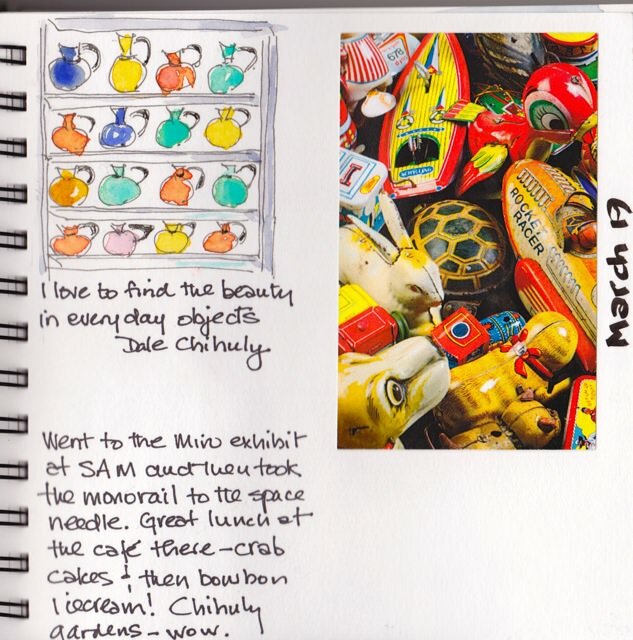 Her tactile notebooks are an inspiration. So for next week’s class, I’ve decided to pack a big bag of woollen strips, all colours and widths and textures, and a piece of linen and to hook whatever words come to me. I’ve always found hooking to be meditative, that wonderful repeated action of pulling the wool and making the loops, and I’m hoping for four days of slow time to reconnect with the narrative. Below is a link to a wonderful video where Sandra talks about her process. So Donna Hrkman, Sandra Brownlee–I am in good company for a return. Stay tuned. 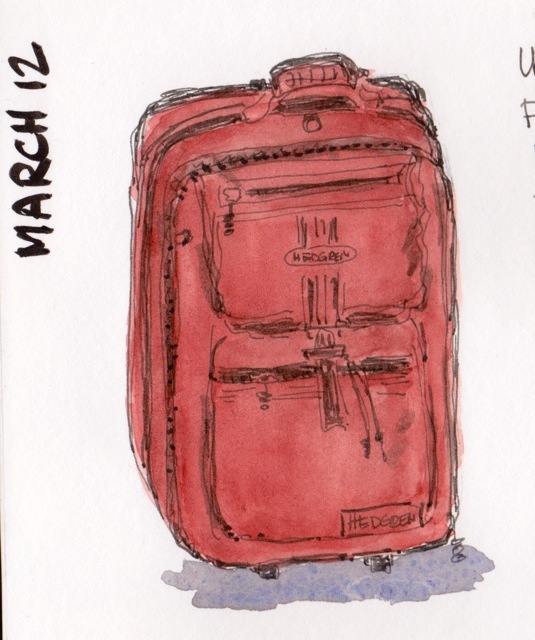 I carried a big hand.book sketch book with me on my month-long stay in Kenya and sketched all the time. 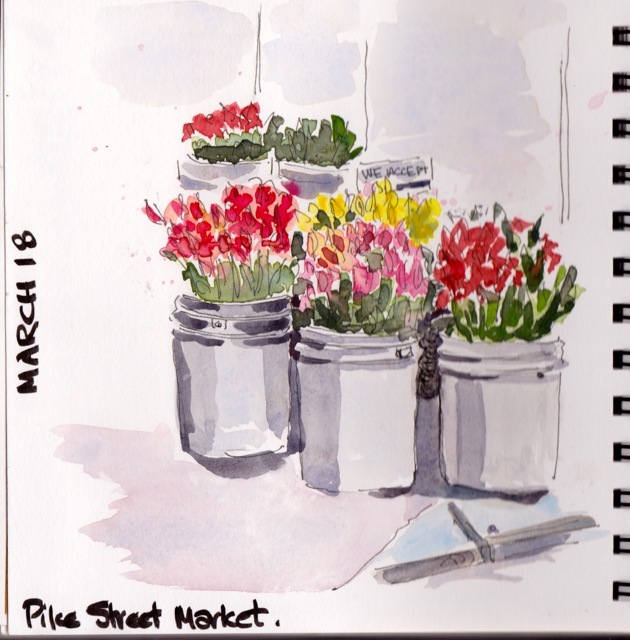 Although there are several on-line reviews dissing this sketchbook, I found the paper quality fine for my Sharpie and paints, and I loved the large format. The cover boards were durable, although now ingrained with Kenyan red dirt, and withstood the abuse of being carried in my backpack. I’ve scanned a few of the drawings to include here. 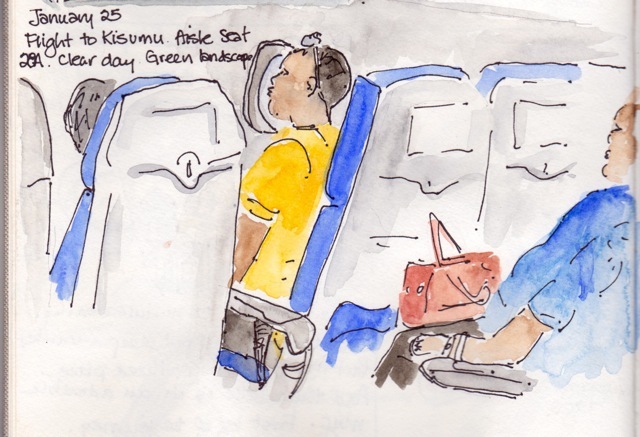 The flight from Nairobi to Kisumu, sketched above, was under 30 minutes so I had to work fast! 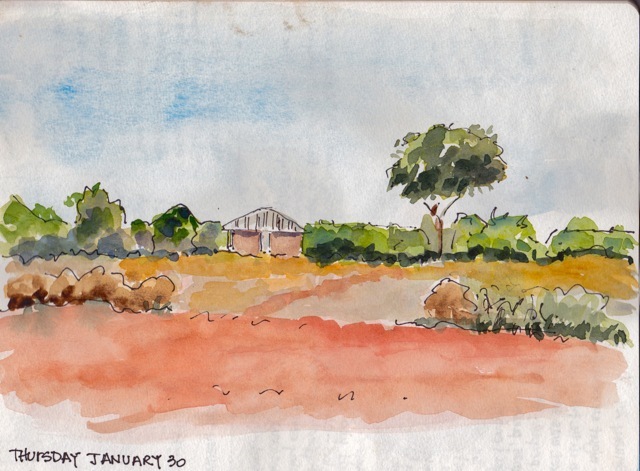 For the next two glimpses of Matangwe, red hard soil, red rooves, red dust, I sat in the shade of a tree and sketched. 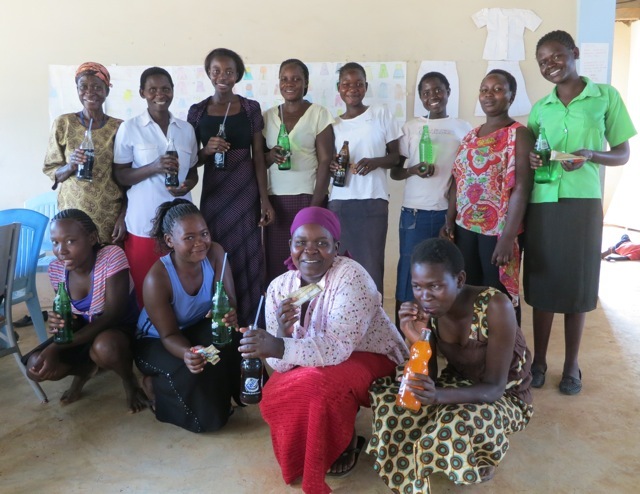 Same for the next pictures in the Kakamega Forest, a wonderful IBA preserve where we stayed for a few days with a group of students and teachers. 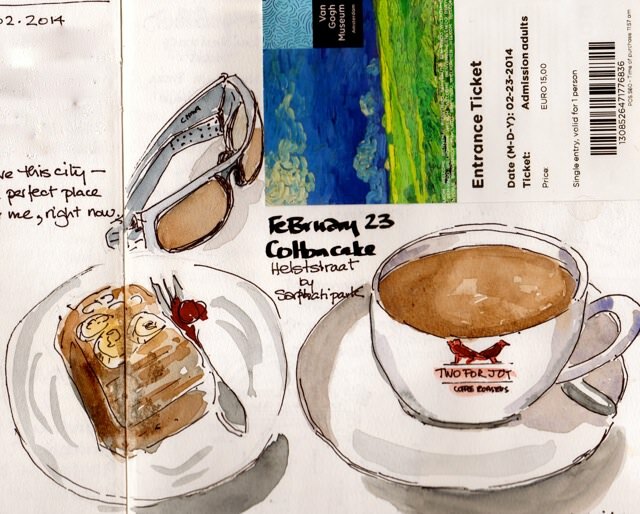 The final drawing is in the Nairobi Airport where I had a seven hour lay over–but a good latte, the first in weeks, and a sketch book go a long way to making the time pleasant. 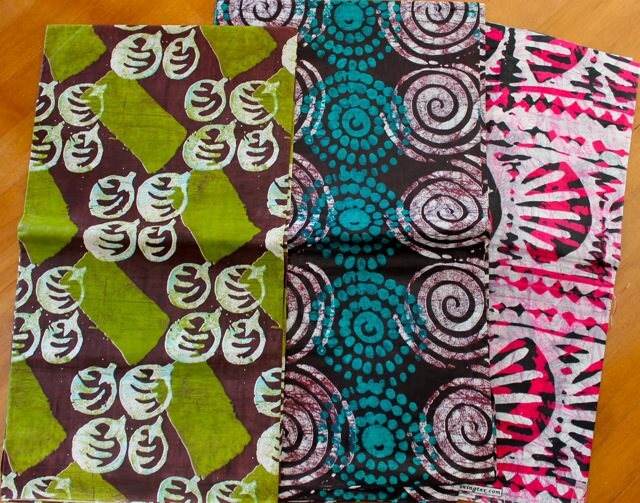 One of my great joys when I am in Kenya is checking out the wonderful cotton fabrics available. This year I bought most pieces from two market stalls in Bondo, and a few additional pieces from streets stalls in Kisumu. 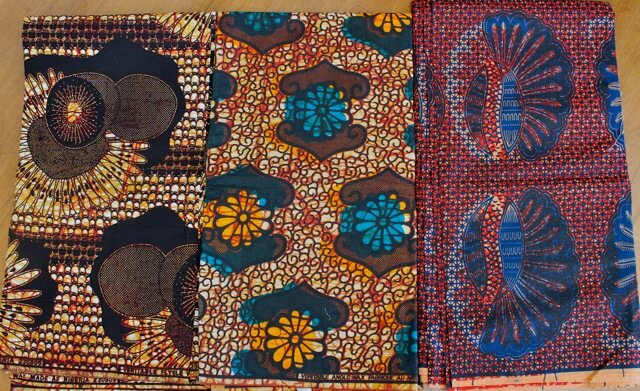 Above is a selection of what the women call Kitenge. These pieces are polished cotton and come in 3 metre lengths. Below is another version of waxed cotton and about twice the price per metre of the material above. 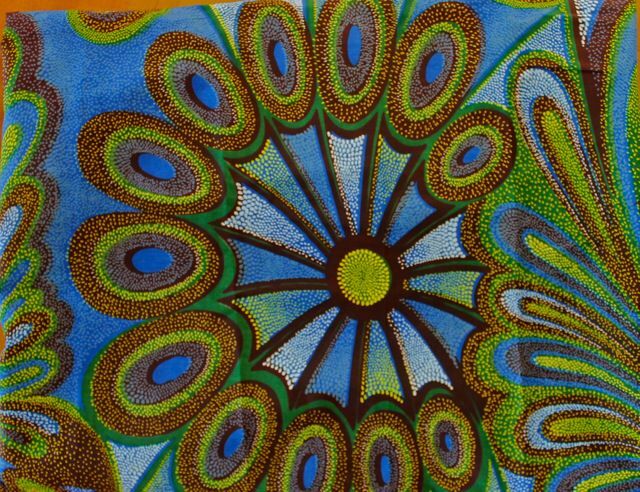 The designs are layered and complex; this fabric comes in 6 metre pieces and comes from Nigeria and Tanzania. 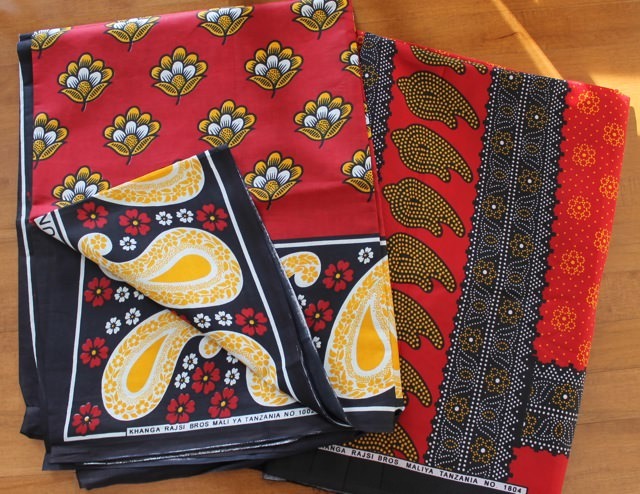 Both of these styles of cotton print make marvellous strong linings for my leather bags. 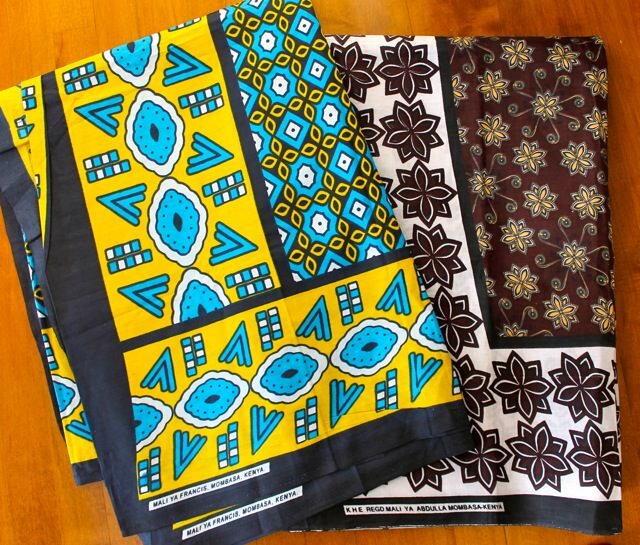 Another cotton print which is available is called a Kanga, or in Matangwe, a Lesso. This is a rectangular piece of cotton which has a border and a kiswahili message on it. 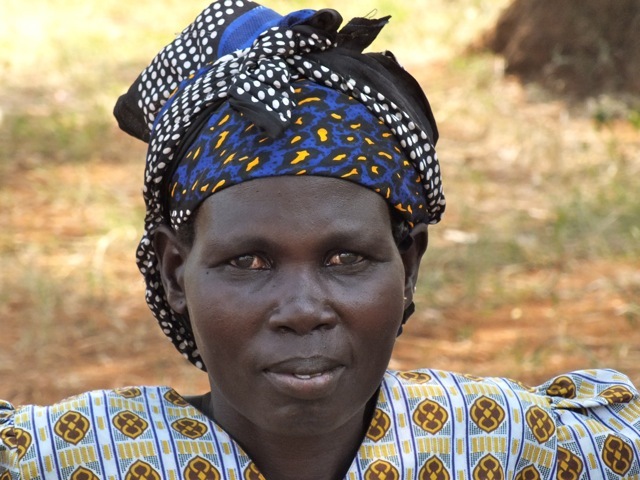 The women wear these as overskirts, head scarves, shawls and baby carriers. 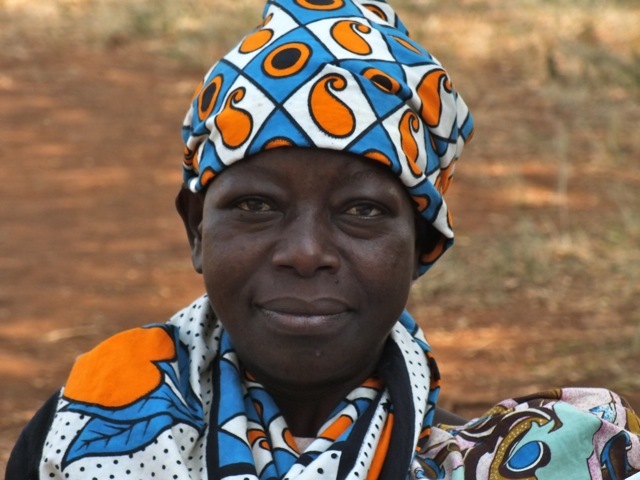 But what I value most is seeing how the Kenyan women wear these fabulous patterns. They combine two or three patterns at one time–and in spite of their difficult lives, have a look of elegance and dignity. 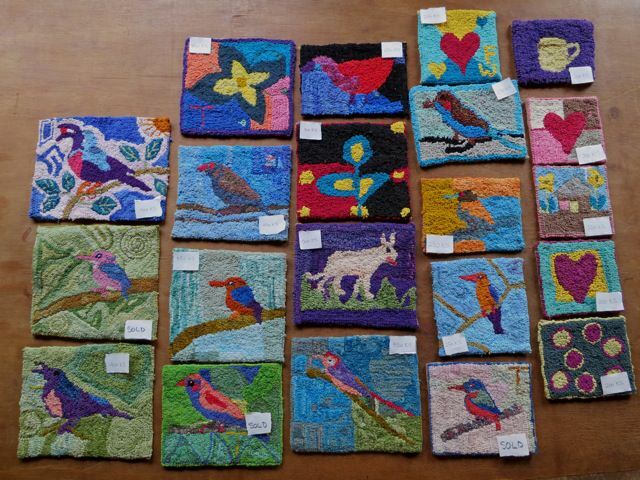 Our first community rug hooking sale was a success. The picture above was taken on the day of the sale. 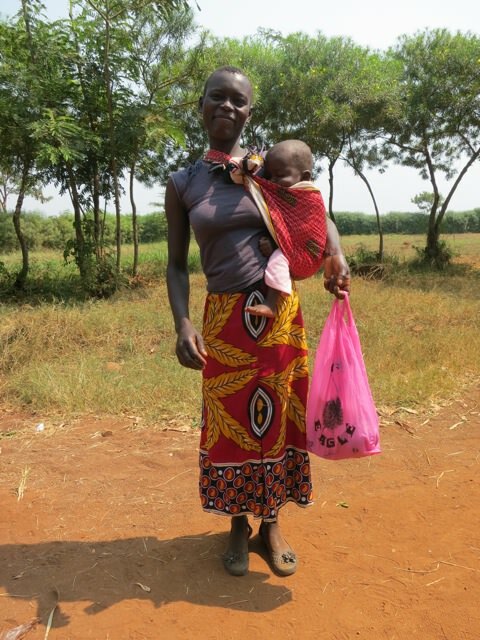 Visitors came from the community, the school and the local clinic. Everyone was impressed with the work and twelve pieces sold. 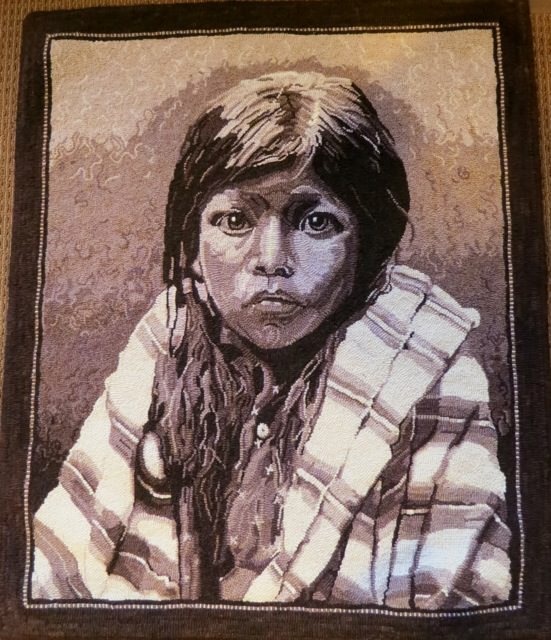 I think the work is remarkable considering that these rug hookers were new to the craft and produced this quality of work after just three weeks. 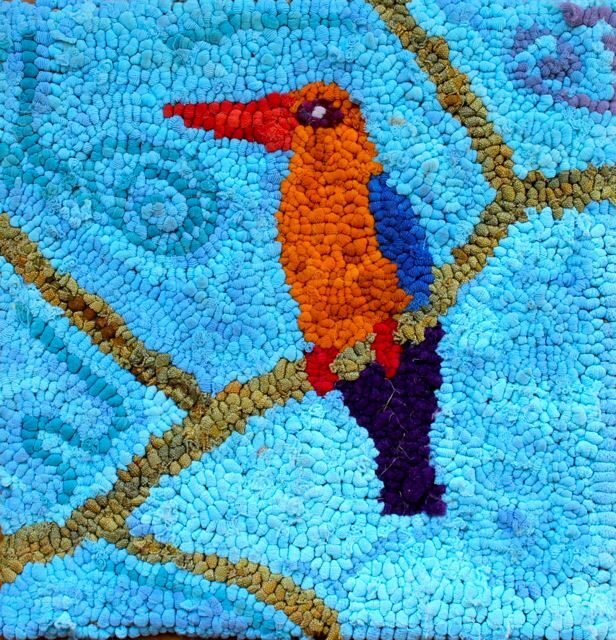 What I think is most notable about their hooking is the background of the rugs–the design and the use of colour and value. It is what makes these pieces stand out. And as we neared the end of our time, the supplies became leaner and some of the later pieces combined t-shirt and nylon strips to good effect. We hooked every afternoon for three hours but some of the women were truly bitten by the rug hooking bug and continued to hook at home–by kerosene lamp! The following two pieces were produced that way. 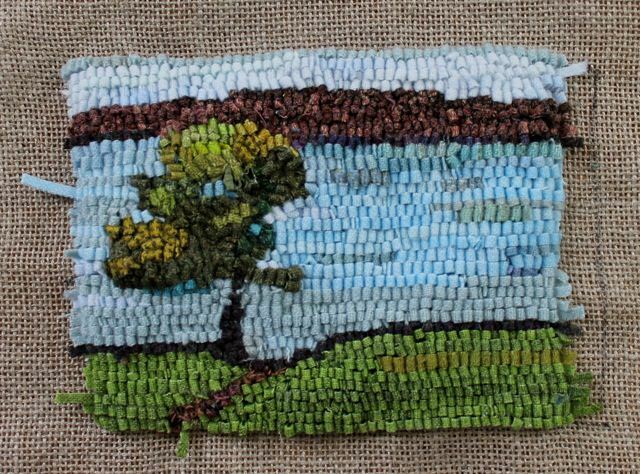 I love how Francesca created a frame of branches in the piece below and how Catherine, in the final piece, used a variety of texture and colour to create a vibrant background. And here we are at our celebration party.